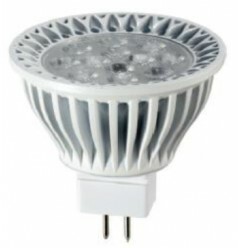 SMD MR 16 GU5.3 Dimmable LED lamp provides industry-leading output power and efficacy thanks to high-efficiency, high-reliability LED source and driver electronics. The lamp’s innovative lens design creates a pleasing, glare-free light suitable for use in all indoor and unexposed outdoor down-lighting applications. The lamp also delivers the high CRI of 83 and ultra-consistent color temperature control critical to multi-lamp applications in hotels, restaurants, schools, office buildings, casinos, retail operations and other public spaces. With a life expectancy of 25,000 operating hours, this UL-registered lamp will provide more than 22 years of service at 3 hours per day.